Whether you are embarking on an overseas adventure, taking a cruise, or planning a trip to Canada, you need to have a valid passport or a passport card. Not long ago, I obtained my first passport for a cruise that I was going on. I was surprised by how much easier the process was than I was expecting. If you are getting ready to apply for your first passport, this information should help you complete the process without running into any trouble along the way. It is important to apply for your passport well in advance of your travel dates. In most cases, it will take anywhere from 4 to 6 weeks for your new passport to arrive. Don't leave the application process until the last minute. Even if you pay extra for expedited service, you still will need to wait a minimum of 2 to 3 weeks to get your passport. Not only that but it will also cost you more money. Even though I didn't pay for expedited service, I received my passport within a few weeks of applying. I still allowed myself an extra cushion of time, however, in case of any potential delays. The application form, which is form DS-11, can be downloaded from the Internet and filled out ahead of time. That way, when you go in to get your passport, you can take a printed copy of your application with you. Just make sure to use black ink when printing the document. Additionally, only print on one side of the paper. If you don't have access to the Internet or don't have a printer, you can always obtain a preprinted application form at a passport acceptance facility. If you want to know where to begin, here is a US passport renewal application form. When applying for your first passport, you are required to turn in your application in person. If you have plenty of time, you can submit your application at a passport application acceptance facility in your area. If you have less than two weeks until your trip, however, you will need to visit a Regional Passport Agency in the United States. There are 24 of them available. The vast majority of city offices and post offices are approved passport acceptance facilities. Just make sure to check if the place where you plan on taking your application accepts walk-ins. In some cases, you may need to make an appointment. When you turn in your application for a passport, you also will need to submit a copy of your official government ID or your driver's license. Additionally, you will need to prove that you are a US citizen. Make a photocopy of your ID, capturing both sides. You can turn this photocopy in along with your application. In terms of proving your citizenship, you can find a list of acceptable options on the Internet. If you are bringing in your birth certificate, you need to bring a certified copy with a valid seal. You will need to submit this birth certificate along with your application. Once your application has been processed, however, your birth certificate will be sent back to you through the mail. Most passport acceptance facilities have an option to get your photo taken at the facility. Alternatively, you can visit certain retail locations to get your photos. For my passport, the cheapest option was to have the photos taken at Walgreens. I was able to get two photos for $9.99 rather than paying $15 at the local post office for a single photo. While many passport acceptance facilities offer photo services, not all of them do. Don't forget to check in advance. Snapping a photo of yourself is also acceptable as long as it meets the necessary requirements for passports. Remember to leave extra time if you have children who need to have their photos taken since they aren't always cooperative. Passports are relatively expensive. Be sure to budget in this extra expense when planning your trip. In 2016, a standard passport for an adult costs $110, with an additional $25 execution fee. Expedited passports cost even more. In addition to the base fee, you also have to pay an additional $60. For children, passports are slightly less expensive, coming in at $80. Again, there is an additional $25 execution fee that you will need to pay. You can find out what the current fees are by looking them up online. Make sure to do this in advance of visiting a passport acceptance facility so that you have enough money on hand. You will need to pay for the execution fee and the passport fee separately. Check to make sure that the facility you are using takes credit cards prior to your visit. If you are submitting a check, you will need to make it out to the US Department of State for the passport fee. The execution fee, on the other hand, should be paid to the passport acceptance facility that you are using. Passports are issued in 10-year increments. In most cases, you can renew them via mail. If your passport needs to be renewed, be sure to leave enough time for the process to be completed before your trip. If your travels are only taking you to Mexico, Canada, Bermuda, or the Caribbean by land or by sea, you can get by with a passport card rather than a traditional passport. Not only do passport cards cost less but they also offer additional convenience. Keep in mind, however, that you can't use a passport card if you are flying to another country. 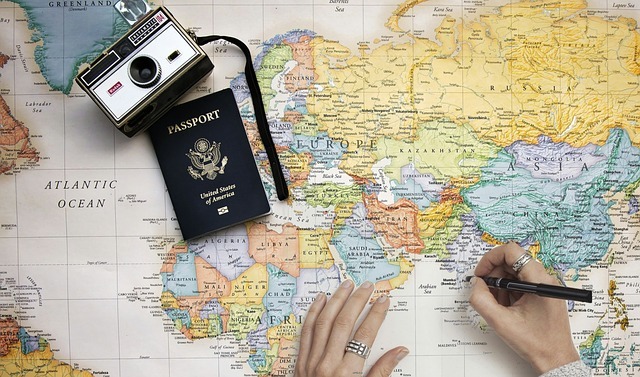 When deciding between a traditional passport and a passport card, think about how and where you plan to travel. If you want, you can obtain both at the same time. Even though you still will have to pay full price for both your passport and your passport card, if you buy them together, you will only have to pay one execution fee, which can save you a little bit of money.